Legendary Lake Sturgeon is an Animal in Red Dead Redemption 2 (RDR2). Animals are found throughout the game based on Locations that they hold as their habitat. Some special animals, known as Legendary Animals, drop special pelts used for unique purposes. 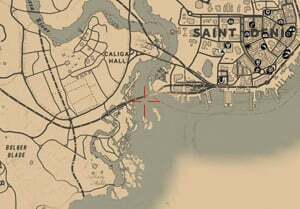 Located below the southern railroad bridge leading to Saint Denis. You have to stand on the bridge in order to catch it so beware of trains unless standing on the edge. Use Special River Lure.